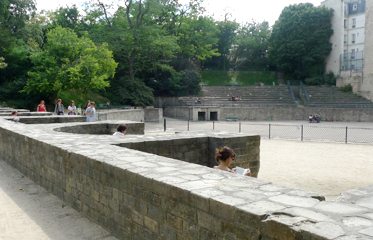 The Arènes de Lutèce are among the most important remains from the Gallo-Roman era in Paris. Constructed in the 1st century AD, this amphitheater with sunken arena was surrounded by the wall of a podium 2.5 m high. The presence of a long stage allowed scenes to alternate between theatrical productions and combat. Even thou the neighbourhood retained name "Les Arenes" nobody new where it was until 1869. In 1883 one third of the arena was uncovered and space converted to the public square. In 1916 additional excavation were conducted by anthropologist Jean-Louis Capitan. On the map bellow from 1713, arenas marked with red overlay are totally unrecognizable. 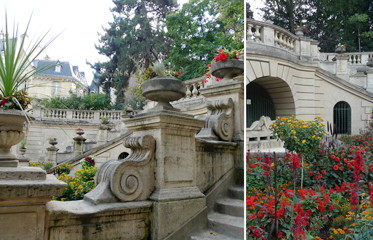 This panorama was actually taken in the area called Square Capitan named after Jean-Louis Capitan. 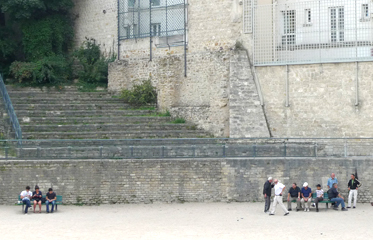 This very secluded area is strictly used by locals for playing, quite appropriately pétanque, [form of boules or bocce in italian] a common ancestry from ancient games played in the Roman empire. Rest of the visitors are just enjoying the peace and quiet of the square and connected park.